Basics are important staples in a girl’s wardrobe since they are so versatile. Becoming a blogger has really made me focus more on buying basics when shopping. Before I would just buy anything I like but now before I make any purchase, I try to ask myself 'how can I style this'; so bye bye to impulse shopping. Also Shirley from shirleyswardrobe has really inspired me with her simple yet very chic style which mostly consists of basics. 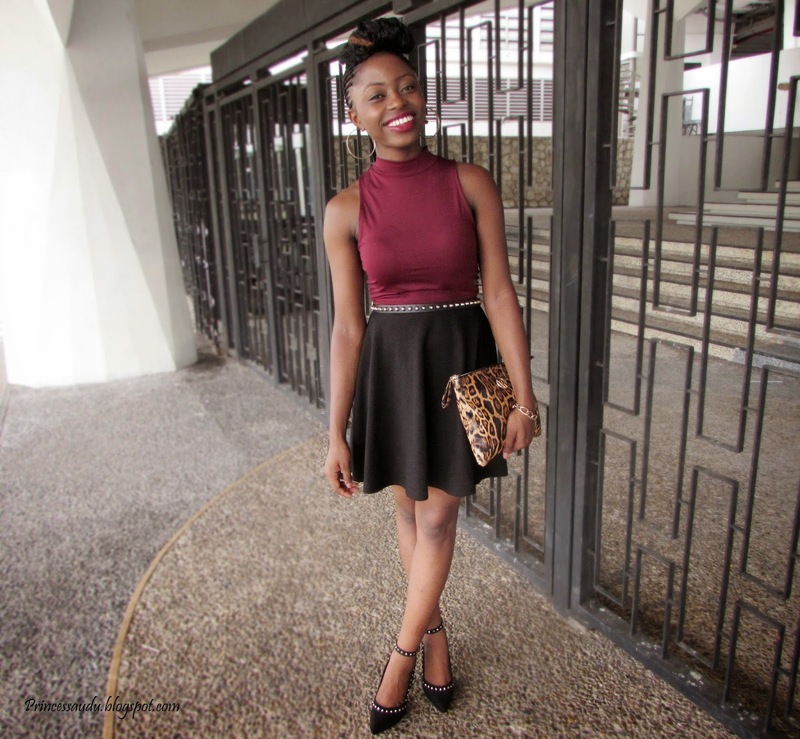 For today’s outfit, I paired my black skater skirt with a crop top which I styled HERE . This look is very simple but the leopard print clutch takes it to a whole new level. Leopard print is perfect for a pop of colour which is why I think every girl should have something in leopard print it can be shoes, bags or even jackets. I would wear this outfit to dinner, a date or a night out. I think this look would look amazing with sheer tights, what do you guys think? Your shoes are killer, girl! Loved them. And you look amazing. Love the outfit, beautiful smile! Stunning as always, I too ask myself how I can style a basic top or bottom before purchasing. I still have my impulse habit tho. I'm an habitual impulse shopper! U are awesome! Love the top and the skirt , look like dress. Just amazing, so chic! I've told you before I think, but I really love that top! Looks great on you and is so versatile! Beautiful outfit! I love basics with bold accesories. This skirt is adorable and I love the clutch you've paired it with! Me encanta como te sienta el granate y la falda es ideal. This look is so chic! I love the color combination and the leopard clutch! Perfection. you have such a beautiful smile! love how chic this outfit is! I am loving those fun heels! Simple but great outfit! You pulled it off effortlessly! Gorgeous studded heels and belt! This outfit looks wonderful on you and that leopard clutch adds the perfect touch. Love the outfit! Especially the top! Thanks for linking up! Amazing outfit, and the top is cute. Answer to your random question, from Benin. Love basic clothes! They are always fashionable. Lovely skirt and bag, I like this look! That smile says everything...stunning! I especially adore that circle skirt! So pretty, I especially love the clutch! Looking edgy and glamorous, Girll! I love animal print clutches. Fabulous look! I like it that the belt matches those details on the shoes. And I simply love the clutch. totally agree with you on that note! it took me a wardrobe full of statement pieces before i realized that all i needed are a few basics to complete my daily needs. i love your outfit here - basics at best! so chic! You killed this outfit! Loving everything about this look! You are totally gorgeous...those shoes are so killing it! The clutch jazzed up the already lovely look. Cute. 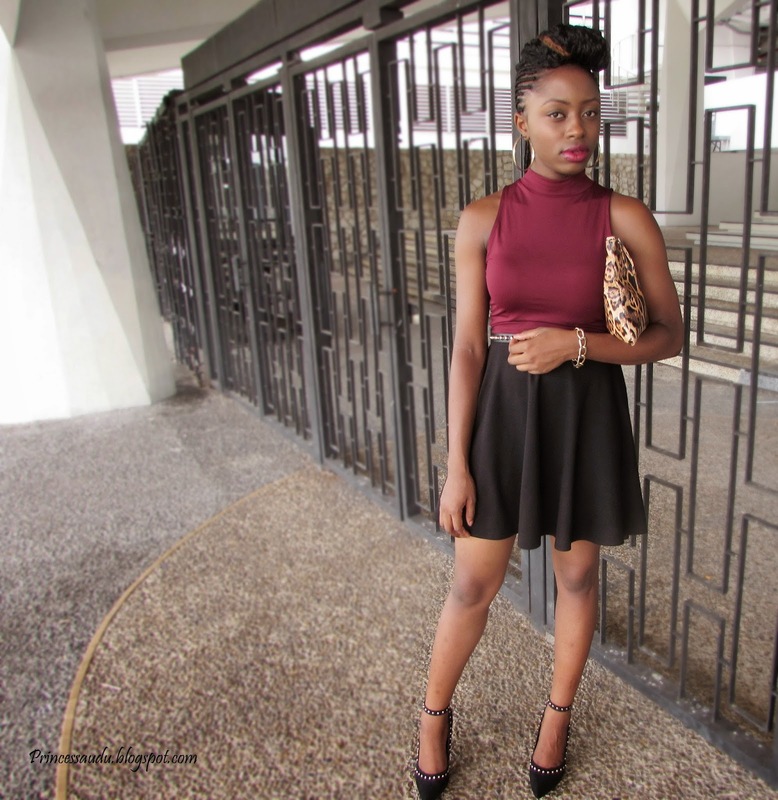 You can never go worn with basics, this outfit is simple yet chic!